Ciri is a playable character in The Witcher 3: Wild Hunt. 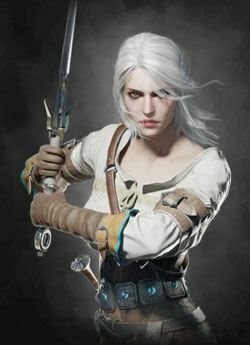 Also known as the Child of Destiny, Ciri is described generally as a weapon that has the potential to destroy the very world that she inhabits. Along with this there are ties to her being an apprentice to Geralt when she was younger. Her Witcher training, coupled with the magical abilities, mark her as one of the most powerful individuals in the world. She will eventually become a playable character as the player progresses through the game. "Cirilla Fiona Elen Riannon — what can I possibly say about her? That we call her Ciri for short, that she was born in 1251, that she has ashen hair and a scar on her cheek? All true, and that's the Cirilla I know best, the one I first laid eyes upon those many years ago, the one who seemed thoroughly, well, not ordinary, but certainly not as extraordinary as she in fact is. For Cirilla is also a highly-skilled witcher, heiress to several thrones, the last bearer of the Elder Blood, a powerful Source endowed with exceptional magic talent and the Lady of Time and Space. Her hair color and date of birth seem... rather incidental now, don't they? I could also tell you she is Geralt's adopted daughter — but that would be a gross simplification. Ciri is much more. She is his Destiny, his Unexpected Child, someone bound to the witcher by Fate's most inextricably tangled fetters. Following age-old witcher tradition, Geralt took Ciri to Kaer Morhen when she came into his care. There he and Vesemir taught her in the ways of the professional monster slayer. It was then that her magic talents were first revealed, and they discovered she was a Source. Ciri's gift proved a curse as well. Because of it, she would one day have to hide from the entire world — even Geralt. Ciri's biography contained one more great secret. Her natural father was none other than the emperor of Nilfgaard, Emhyr var Emreis. His words confirmed the fears swirling in Geralt's mind. Ciri had returned and was in mortal danger, for the unrelenting Wild Hunt was on her trail. Yennefer made it clear why the Wild Hunt wanted Ciri: Eredin wanted the power latent in her Elder Blood. She also let Geralt know that Ciri had been seen in war-ravaged Velen as well as in Novigrad, the largest city in the world. Reports that Ciri had spent time at Crow's Perch proved true. She was there as the guest of the local warlord, Phillip Strenger, also known as the Bloody Baron. Despite his violent moniker, this man treated Ciri with kindness and respect." some where in skellige's islands.